Spirit Cruises is New York City's most vibrant and entertaining dining vessel. Its bountiful buffets, stunning skyline and Statue of Liberty views, and non-stop DJ music provide a one-of-a-kind New York experience. Cruising the Hudson River year-round, Spirit has a variety of lunch, dinner, moonlight and holiday cruises, plus dozens of themed cruises, to choose from. Our ships depart from Chelsea Piers in New York and Lincoln Harbor in Weehawken, NJ. Be among the first to cruise the newly renovated Spirit of New York and an all-new menu by Chopped champion Chef Eric LeVine. The renovations include vibrant lighting and decor, fresh carpeting and chairs, a newly constructed outdoor bar and rejuvenated interior bars, interactive dance floors and DJ booths with customizable lighting, and more. Meet the Entertainment Cruises New York fleet in this short video. Also, check out Spirit Cruises for catering and special events on video here. The Huffington Post and Loverly: Atlantica and Manhattan Elite included in roundup of unconventional destination wedding ideas. Forbes and Her Etiquette: Spirit of New York included in a top 5 article of ways to experience last week’s super moon in New York City. Forbes: Bateaux included in a roundup of the best ideas for a last-minute Thanksgiving getaway. Broadway World: All vessels included in a roundup of where to celebrate Thanksgiving in NYC. Manhattan Digest: Spirit of New York’s Santa Lunch Cruises included in a roundup of the ideal NYC itinerary during the holidays. 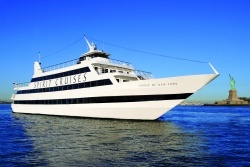 Jetsettersblog: Spirit of New York’s Santa Lunch Cruises included in a roundup of the ideal NYC itinerary during the holidays. Check out the Spirit Cruises blog here, and Spirit Cruises on Instagram here.